Yesterday, news broke that 12 alleged internet fraudster were arrested in a popular Lagos club and this put social media in a frenzy. 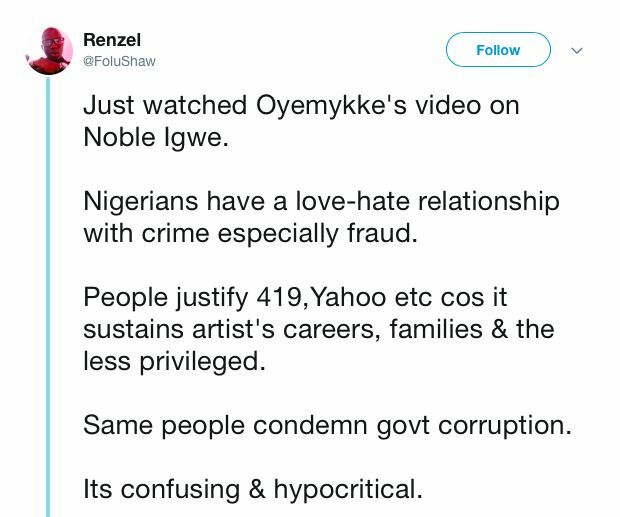 Following the reports, Nigerians took to their various Twitter accounts to address the issue including style influencer Noble Igwe who made it clear he was against these fraudsters, often called Yahoo Boys. 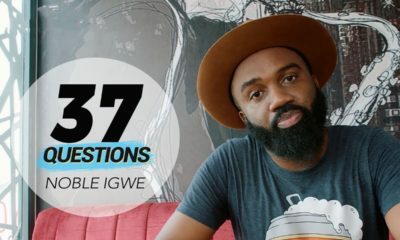 Noble Igwe also made some comments about certain businesses being fronts for fraud. N I G E R I A It’s Our Country & We can all make it better. We All have a role to play. Our Politicians are stealing us blind but we can’t balance that scale by stealing from one another. We can’t be motivational speakers only when it suits us. To create a better tomorrow,we have to clean up the today. 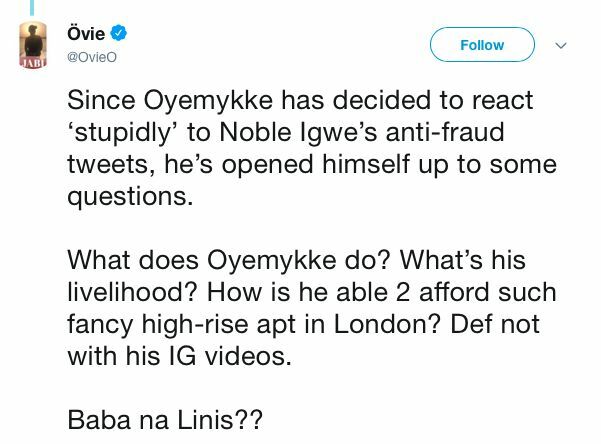 After his tweets, comedian Abisoye Olukoya Michael took to his page to call Noble Igwe out, tagging him a “snitch,” saying he’s putting genuine businesses at risk. 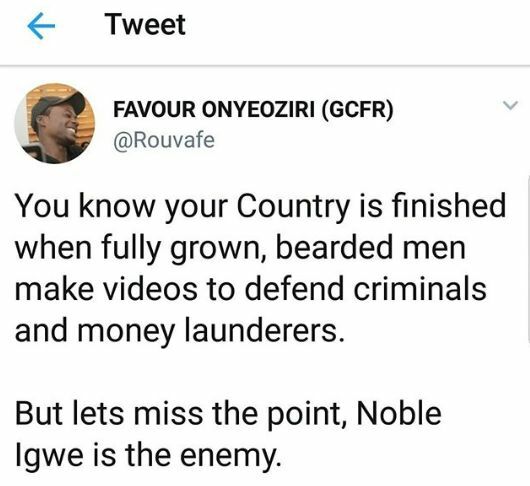 It is obvious Noble has a lot of haters; but the menace of 419 needs no kids glove when calling out. Smear the brush with plenty of paint and let the authorities do the cleaning. My brother and I are trying to set up an an online platform and I was looking at businesses doing the same thing and their prices left me befuddled. How are they then making a profit? It is obvious what is going on. I understand how you feel, business in Nigeria is tough. Some will advice to create a new niche market focused on rich people because if you are trying to sell everyday supplies or needs those markets are highly price competitive. But hopefully you have alternative ideas. The short and balded imp is annoying but damn right. Those guys are one of the main reason I don’t use my Nigerian Passport. Those guys are worse than Kidnappers in my view. You won’t understand the damage those criminals have done until you leave this shithole or wants to do an legitimate business internationally. And to make it worse ..Juju and rituals and abnormal behaviors are now part of the process. I Just pity the girls that follow them. Most young women walking around Major Nigerian Cities especially Lagos are just walking corpses. Every thing has been sucked away. But let us pretend and call them hustlers and bury our head in the sand. Just leave those ones o. Whatever it is they’re looking for, they’ll find… Only they might not like it at the end. Noble ride on. This is how Nigerians are. It is because you’re not the everyday good looking Nigerian they want to be like, and the people you’re calling out exactly fit into this category. 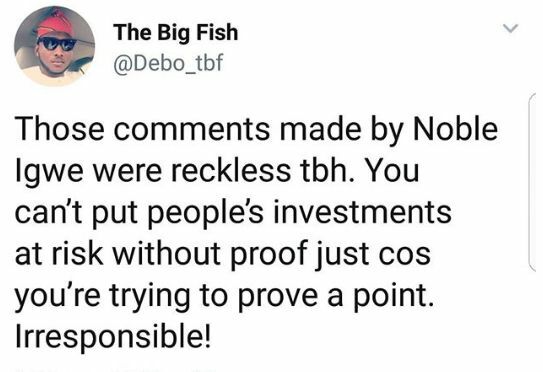 To a Nigerian fraud and theft is always OK as long as you’re the one benefitting from it. Shebi election time you will start accusing politicians of stealing, because those ones came from Mars. I don’t take “Instagram comedians” seriously anyways. It’s like they wanna do/say the most nonsensical things in an attempt to keep their followers. This looks like what that bearded man up there was trying to do. Who’s shutting down what? All because of what noble said? I REALLY detest saying “Nigerians are” cause it’s part of the problem. But i can’t help but say that the moral standards of most Nigerians is dangerously low, especially for people who espouse belief in God. Right before I left nigeria this year, I did a stint at a local salon cause I was tryna learn how to make hair. The question of “would you date a Yahoo boy or a married man?” came up. The responses left me bewildered. I couldn’t even say anything as my own thoughts would have strayed strayed vastly from popular opinion there and I definitely wasn’t trying to get into any debate about nothing. It just left me with a lot to think of. Sigh. Nigerians have been justifying criminal behavior since I can remember – so long as we have nebulous “politicians” or ‘government’ to blame. 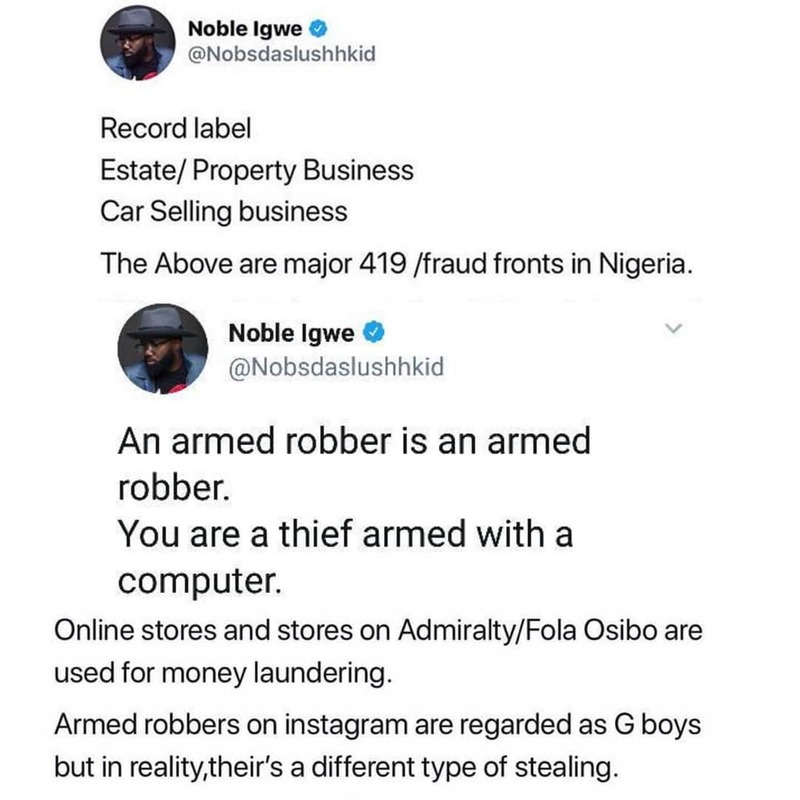 Noble ain’t lie. The table is shaking oooooo. 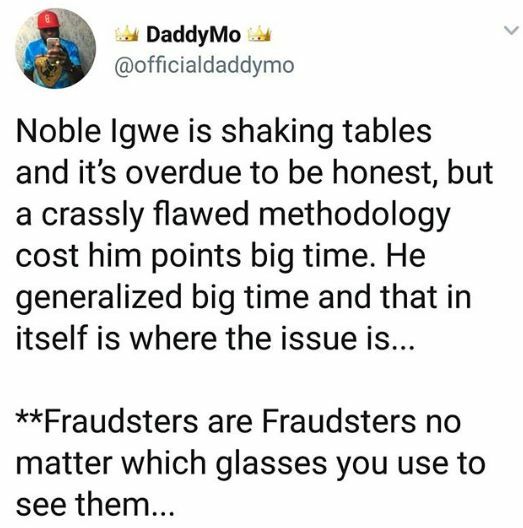 Oga Noble has a point, fraud is the new normal in naija. Just because its paying bills doesn’t mean we can’t call a spade a spade. We need to start using our intelligence for something greater, something we can be proud of 10 years from now. And as for the govt, continue ruining lives, your own day of judgement will come. Not only in Nigeria, you guys always talk about Nigeria. 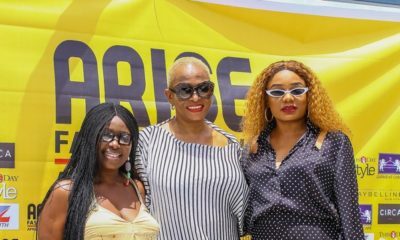 Here in Canada, even in the U.K., the USA, and in Malaysia, there are THOUSANDS of Nigerians and other Africans doing fraud, but they’ll only focus on the ones back home. BN thank you for posting this. I was minding my business on IG earlier today when I noticed people cussing Noble out on two consecutive posts of his. Ah-hn, I didn’t understand why, some where even threatening him, both men and women, young and old. Since I couldn’t find the genesis of the issue, I waka pass. Only to see this now. So this is all he said that people are threatening his life and cussing him out? What Noble said is true! I’m not a fan of him but I don’t see anything offensive in what he said. Even some runs girls are owning salons and nail studios in Nigeria as a cover up, of course not everyone who owns one is a fraudster. Even here in Canada, and in the U.K., you see Nigerian, Ghanaian guys and girls and other Africans doing fraud. 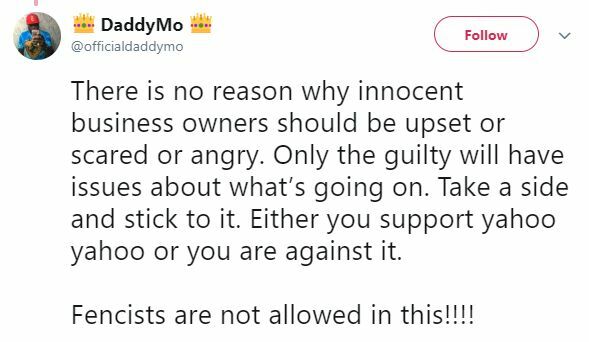 Anyone who’s angry at his tweets is guilty. Even Tunde Ednit dedicated a post on Instagram to attack Noble Igwe. Please tell me, what’s offensive? 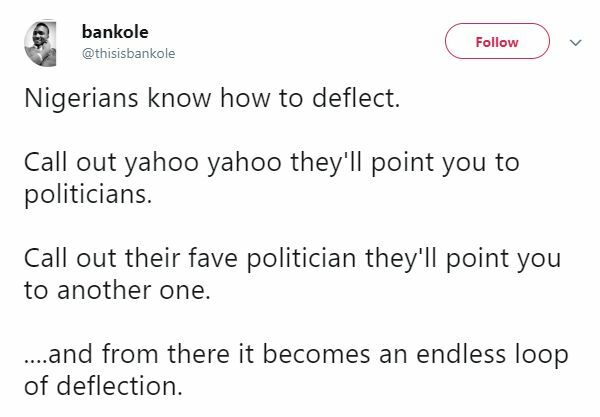 The main yahoo boys/fraudsters in Nigeria = The government and people in power. The victim = The masses. Ps: I can’t wait for these our politicians to also get served, the youths are watching only a matter of time. You will all pay back all you have stolen from us. God still lives. Apparently Noble has a right to free speech. But freedom to enter these business to trade, conduct business or seek employment from will not be free. Calling all Nigerian businesses that operate online business model money laundering enterprises is reckless. There are venture capitalist thay research Nigeria as a country and his generalizations are reckless. If you know a Yahoo boy, call them out by their first and last names. It’s like saying all igbo men in business are crooks. Name criminals and dont generalize! Bayo, if a venture capitalist limits its research to SM tweets, it won’t be in business long. @ Bayo, why don’t you cite the Yoruba as a people who can be said to be all thieves, being as Yorubas have “cornered” the Yahoo/bank fraud “businesses” in the United States, the United Kingdom and pretty much of the EU? 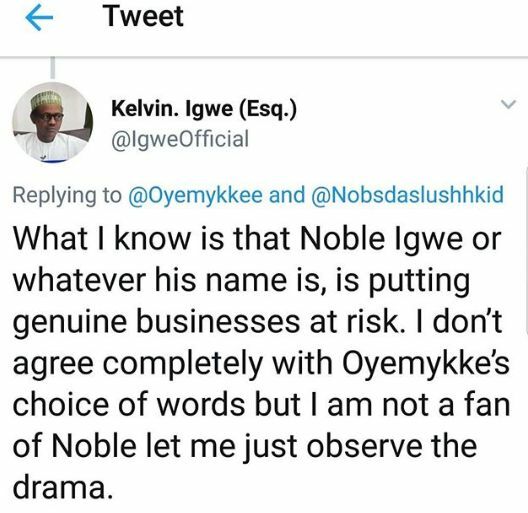 You can see it is a Yorubaman who has come out publicly to chastise Mr Noble Igwe who has the balls to challenge the status quo. 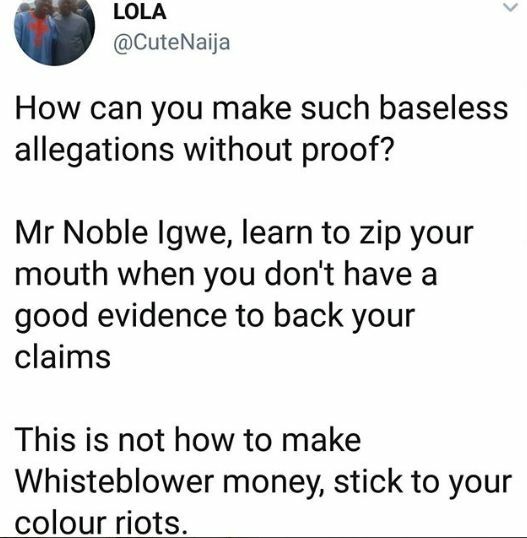 I normally don’t like going this route but it is obvious you are one of those whose oxen have be gored by Mr Igwe’s remarks. 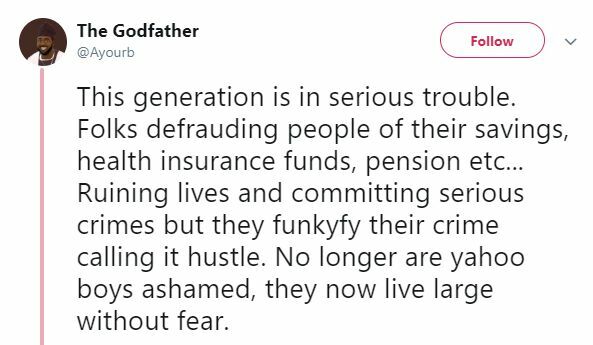 Perhaps you need to consider being a thief…..app you don’t realize that’s what you are when you defraud people and describe such despicable acts as your “hustle”. Tsk tsk @ Bayo! Your Senator is a drug baron facing likely extradition to the United States. Let me know if you still want to run your stupid mouth. John I don’t understand this comment or the point you’re trying to make. 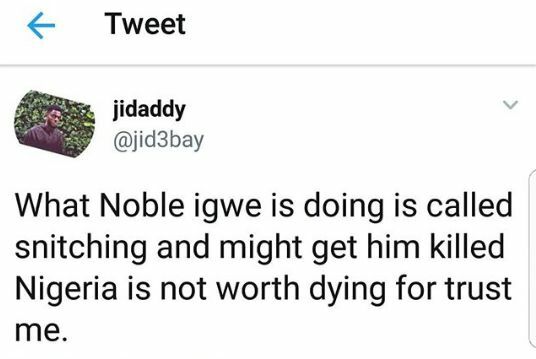 Yes, Noble Igwe has a right to tweet and I agree with everything he said, that being said; what has Yoruba got to do with this? You’re always talking nonsense. 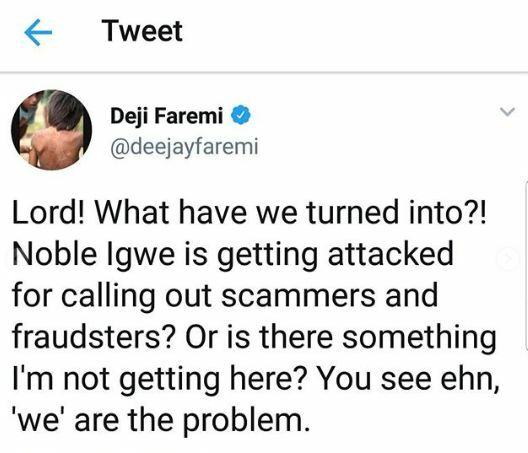 Hi Bayo I had to read the Igwe comment again, I partly agree with you but the logic I deduced was online stores can be independent of money laundering but fraudsters depend on using music business, online stores as fronts to make their money look legit. The sad thing for me, I just look at history and look for historical strands repeating again. It is more like the old allen avenue/powder avenue or powder dealers and car sales. It does not mean selling cars mean you deal in powder but just some powder dealers use car sales as a front. But still, we like to throw unproven aspersion out there not out of malice but sometimes a product of an environment where we lies are eaten and dispersed again for further consumption. About time these fraudsters, scammers get called out. Noble, thank you. 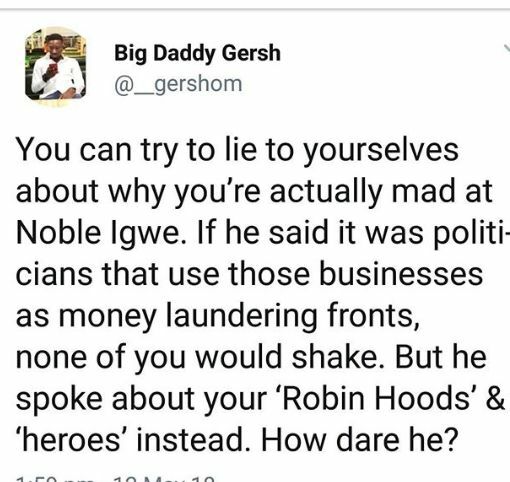 Most Nigerians only run their mouth at the back but are cowards about the truth openly. Another thing that’s so sad is the fact that majority of Nigerian “so called businesses” are mostly fraudulent. And once there’s flashy cars and houses, Nigerians don’t care anymore. My only question is, how do you snitch on the obvious? Anyone heard of a town called Ibusa? In Delta. The youths manage to scale through school cert level just to learn basic communication. Most indulge in this crime and it spreads beyond. The home of Fred Ajudua and the great Pat Utomi. There’s this popular guy selling hair on IG with some shops around….The day I stumbled upon his page on IG and his prices I was flabbergasted…my mouth was wide open for like a minute or 2 and I kept wondering…..these same hair extensions, I could tell where he sourced them by the looks of the hair and weft pattern and by extensive look. Imagine the hair extensions being sold at cost price….constant sales…ridiculous discounts and you wonder, hoe cheap could real real hair really be. Anyways, long and short of this story is “MONEY LAUNDERING 101” …God save us in Nigeria. If the decision were up to me, these Yahoo boys should be tied to a stake and roasted alive! i was a victim of their scam circa 2013.One carefully replaced the a numeral ‘1’ in my official email account with ‘l’ and successfully cloned the correspondence trail i had with a Chinese supplier.Before i got wise to the scam, i was in the hole for about 10000USD…and i was lucky..a colleague suffered a similar fate, same scam but lost 100, 000USD!!! !…..BURN THE NEGROES ALREADY!! Freedom of speech is awesome and I’m glad Noble made use of it. HOWEVER, my question now is …….. to what end? So we have a poor country (yes, not all Nigerians live in Lekki etc), we have our primary source (oil revenues) unevenly distributed coupled with the harsh operating terrain making it near impossible for valid businesses to flourish. We have a government that won’t sign or spend the budget as it should, we have no social security system. Whilst not justifying it, Nigeria’s crime scene is a large contributor to what runs the economy (informal distribution of oil revenues/government money, CBN favoritism – e.g. Alhaji – hello?). You think all these lavish weddings every weekend are legitimately funded? 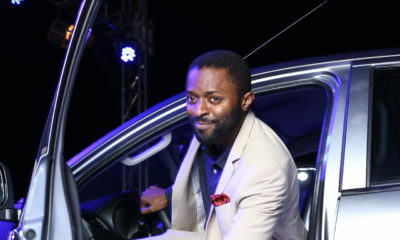 We have the richest people in Africa but not the richest companies, what does that tell us? How are they making their money?! Anyway – back to yahoo boys, so now they’ve been called out and arrested, what do you think will happen now? Is it our police that beg at every check point you expect to prosecute these guys? What will happen is, deals will be cut and yahoo boys will have to do more because now they have to constantly remit to one sergeant somewhere. The game continues. This is a superficial approach to a deep seethed problem. People who can buy/rent guns and plan/execute armed robbery and kidnapping, should be able to rent a grinder/tools or learn a trade. Please quit justifying criminality under any guise!